In 1972, I went to Europe for the first time. During a 17-hour train ride from Amsterdam to Rome, I shared a compartment with a young Italian guy who spoke about as much English as I spoke Italian but was as eager as I was to pass the time in conversation. So I wound up learning some Italian, and he wound up learning some English, and, as I was getting ready to leave the train, he told me that he had a gift for me. The gift, it turned out, was the location of and the story behind what he explained to me was a self-portrait of Michelangelo, known to every Italian but kept out of the guidebooks and off the tour guides' itineraries so the Italian people can have one Renaissance masterpiece all to themselves. A week or so later, when I got to Florence, I went where he'd told me  and there it was, out in the open for anyone to see or even touch. Over the years, I've been back to Florence many times, and I always pay a visit to my buddy Mike. And, sure enough, tourists walk right on past him by the thousands and never notice him but every Italian family stops to pay him homage, and every Italian father worshipfully repeats to his children the same story of Italy's secret Michelangelo I heard on a southbound train in 1972. Is this a real Michelangelo, or just a long-treasured urban legend? I have no idea. But I'd like to think the story is true. Regardless, there are plenty of definitely genuine Michelangelos in Florence, including my favorite of his three Pietas, shown at the right. It used to be displayed inside the Duomo  the city's cathedral  and later was moved to the Museo della Opera del Duomo, a nearby museum. 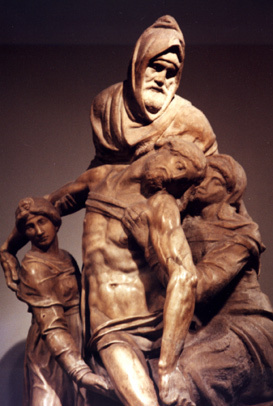 Joseph of Nicodemus, in the back, is an acknowledged self-portrait, and the crack in Jesus' arm  hard to see here  was made by Michelangelo himself, frustrated by age and encroaching blindness, not an irate art student. (That was the most famous of the Pietas, normally at the Vatican in Rome but attacked by an irate art student named Laszlo Toth while on display at the New York World's Fair in the early '60s.) Michelangelo actually threw the piece away, unfinished, and one of his art students rescued it, put an amateurish face on the Mary Magdalene at the left, then blessedly realized he was ruining a treasure and stopped messing with it. More info on Michelangelo and his works can be found here.